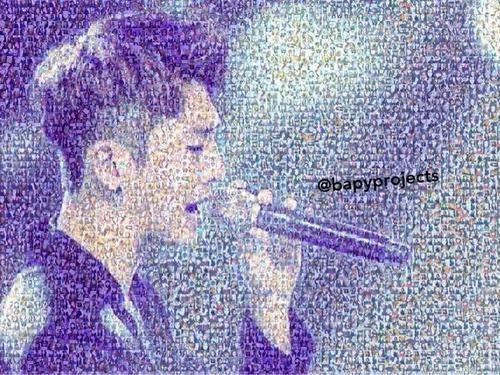 Here's the preview of the mosaic of Bang Yongguk's picture made with BABYs' selcas! Singapore BABYz also received their BANG! cupcakes and BAPYProjects confirmed that they received 131 donations that will go to Korea’s first Children Rehabilitation Hospital under Yongguk's name. One of the admins will fly to Korea and deliver everything to Yongguk. Pictures of the gifts will be posted in April. We are happy to announce that we are collaborating with BABYPROJECTS, a group of 5 BABYz that organize projects for the group and the members. This time, they are organizing a project for our leader's 24th birthday, that is coming soon on March 31st! 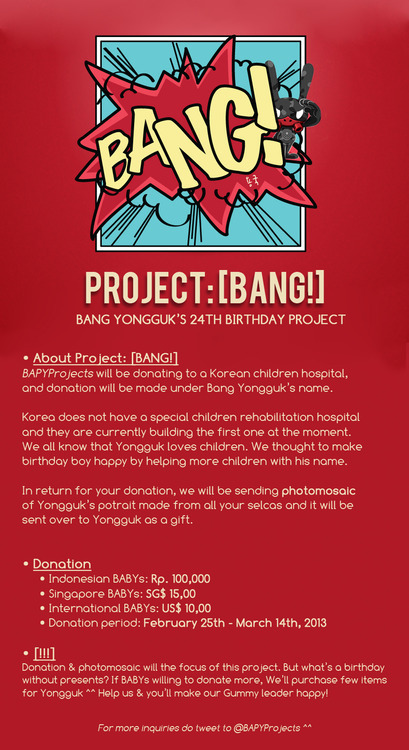 We will be donating under Yongguk's name to Korea's first Children Rehabilitation Hospital. BABYz should all know Yongguk loves children, we thought to make the birthday boy happy by helping more children under his name. 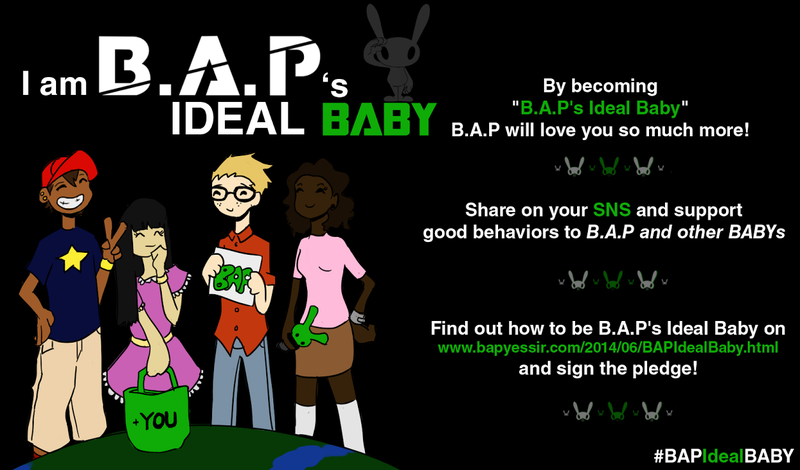 BAPYPROJECTS will handle the donation and gifts purchasing. Please read this post to learn how to contribute. You can ask us question about the project itself, but please do contact BAPYPROJECTS only concerning donations and such. B.A.P YES SIR! will be participating in this project, so whenever there are updates about it, we'll make sure to let you know as soon as possible. 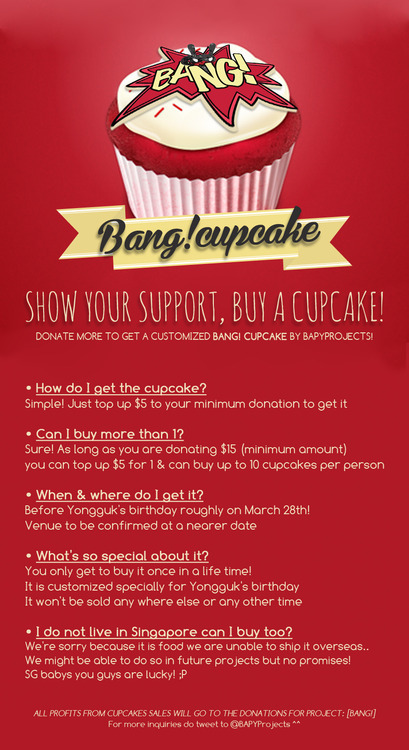 ^_^ Please contribute so that we can make Yongguk proud! 24th birthday? Not 23 since he is born in 1990? I'm late to know this.. :( they already took down the form..